STROJÍRNA LITVÍNOV AT DRINKTEC 2017 – STROJÍRNA LITVÍNOV s.r.o. We are a stable Czech Company, active in the mechanical engineering industry since 1999. We specialize in conventional and CNC metal machining, up to 20 tons, and since 2001 we also develop and produce axial fans. Subsequently, in 2008, our Wind Tunnel Division commenced their work. We develop and supply free fall simulator technologies and, on a world-wide scale, we are one of only three producers of this technology. In 2010, we founded the Construction Division, which realizes the deliveries of our turnkey solutions. In the beginning of 2014, the Design and Construction Office started their work, led by a team of experts, to support our activities. In 2015, we have expanded our business portfolio by adding the Brewery Division and, in cooperation with the Design and Construction Division, we supply a production program of breweries for 10, 15, 20, 30 hl. We also carry out installations of technological equipment, we provide machine maintenance, machine part overhauls, we produce weldments, we weld using WIG-TIG, MAG (CO2), and we create project and production documentation. Strojírna Litvínov and OSSEGG Holding exhibited at the international fair trade drinktec, held in Munich, 11.9. – 15.9.2017. Drinktec is seen as the platform for world’s innovations for the beverage and liquid food sector technologies. Presented are solutions for global companies as well as SMEs. With over 76,000 visitors from more than 170 countries the fair trade surpassed all expectations. The number of exhibitors increased to 1,749 from 80 countries. Strojírna Litvínov and OSSEGG Holding presented brewing technology for microbreweries, supplied in a production program with brewhouse volume of 10, 15, 20 and 30 hl. Visitors to the exhibition stand had the opportunity to view the 15 hl brewhouse, with a fully automatic control. 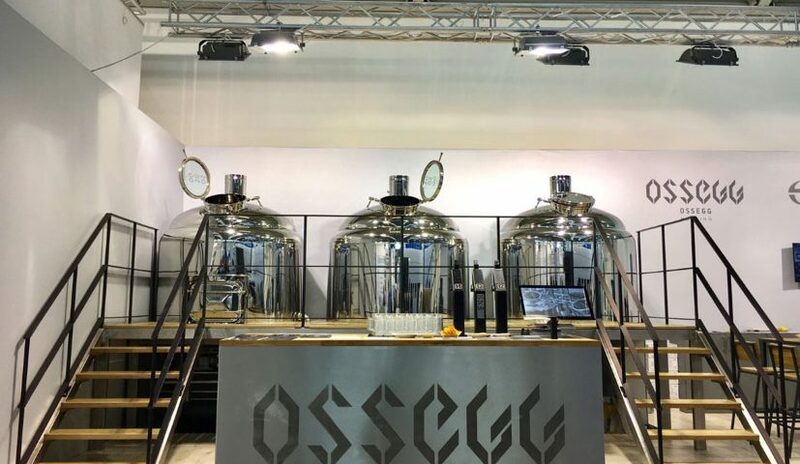 The exhibition stand was very well received by visitors, who also showed interest in elements of interior, specially designed for concept of microbreweries OSSEGG, such as the beer tap and restaurant furniture.